The Educational Kinesiology and Brain Gym programme offers individuals the opportunity to overcome any challenge whether it is in learning, business, sport, performing arts or your personal life. It is a programme that has changed my life and only wish it had been in my school. I will help you clear the ‘barrier’ that is holding you back from achieving success in any area proving difficult. We will use simple movements so you can enjoy success in any area that you thought you could never achieve in. You can enjoy a level of change immediately. I guarantee results if you follow my technique. You then revisit the challenge again relating to your goal at the beginning and notice what is different and how you feel about it now. You will notice a change immediately. Choose which movements you would like to do at home for 15 minutes a day, for a few days. This will help make your goal become automatic, easier, enjoyable and with lasting results. The process is as simple as that AND you have fun at the same time, providing you with the changes you would like in any area of your life. That depends on your level of development, the challenges you would like to clear and / or the goals you would like to set yourself and achieve. Usually anywhere from 6 – 10 monthly sessions will make life long changes. I will ask you to do some movements at home that will take no more than 15 minutes daily for about 3 weeks before the next session. Sessions are usually once a month. 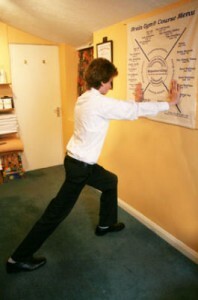 ‘Movement is the door to learning’ (Dr Paul E. Dennison, creator of the Educational Kinesiology programme).